Wild Plants often stop me in my tracks. On a typical wander through the forest, I usually take my precious time to pause along the trail and examine the plant life. I take a mental inventory of the various species that I encounter, often pondering their ethnobotanical applications and imagining how each plant may have traditionally been used to satisfy the basic survival needs of food, medicine, and fiber back when folks lived a lot closer to the earth. Sometimes it takes me forever just to make my way a few short yards down the trail, since I stop to look at plants so often. What can I say. . . I’m a plant dork, and I’m not afraid to admit it. The other day as Pat and I were slowly hiking through Stimpson Family Nature Reserve, nibbling on Blackcap Raspberries and Trailing Blackberries along the way, a conspicuous plant stopped us in our tracks yet again. As it caught my eye, my mind suddenly flashed back to the very first time I stumbled upon this species, many years ago when I was a new student at Wilderness Awareness School. With great curiosity I pointed out my new discovery to a fellow classmate at the time, who quickly identified the plant as Red Baneberry (Actaea rubra). He informed me that eating Baneberries might be the “bane” of one’s existence, as the entire plant is highly poisonous and can cause nervous system damage and possibly death. Wowzers! I had thought. Better be careful of that one. The interesting thing is, throughout the past ten years that I’ve spent cultivating relationships with wild native plants of the Pacific Northwest, I can probably count on one hand the amount of times I’ve consciously encountered Red Baneberry. Perhaps I’ve brushed past it countless numbers of times, however, I can’t recall many instances where I’ve actually stopped to acknowledge the plant. Flash forward to that recent day at Stimpson, when Pat and I came across Red Baneberry. Like I mentioned, this plant stopped us in our tracks. Its bold berries make a statement. So we stopped to listen to what Baneberry had to say. We lingered there for a while and took note of where it likes to grow, and which plants it likes to grow alongside. We got acquainted with its clusters of conspicuous shiny red berries. We compared its berries to other red berries in the forest, Red Huckleberries and Red Elderberries at the time. We placed a Red Baneberry leaf alongside a Trailing Blackberry leaf, taking note of the similarities and differences. We held its leaves in our hands, feeling the sensation of its sparse hairs on our skin. We didn’t just give Red Baneberry a casual head-nod. We actually took the time to meet the plant. We said hello. We gave it a handshake. We had a focused sensory experience with the plant, and that made all the difference. Upon further research about Red Baneberry via the PNW plant dork “bible” commonly referred to as “Pojar”—a.k.a. 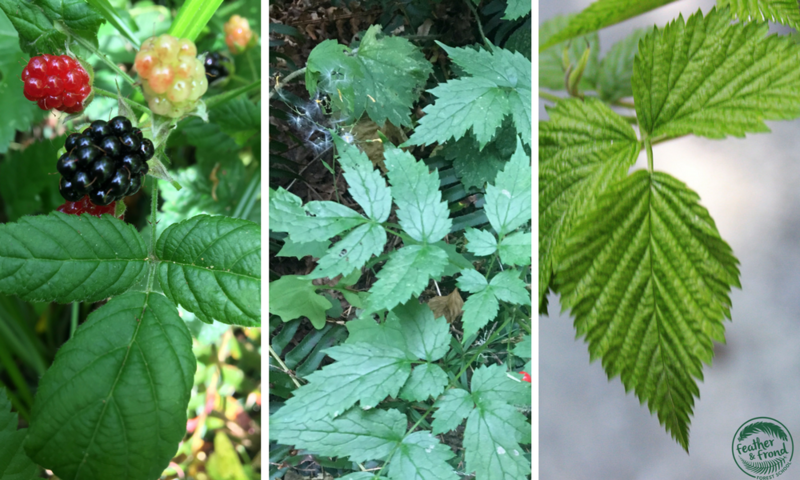 Plants of the Pacific Northwest by Jim Pojar and Andy MacKinnon— I’ve learned that although the berries, roots, and foliage of both White and Red Baneberry are highly poisonous and can induce “vomiting, bloody diarrhea, and paralysis of respiration. . . the Quileute chewed the leaves and spat them on wounds". Hmmm.. I find it truly fascinating how certain plants can be regarded as “deadly poisonous" when consumed in higher doses, yet “healing” when used in much smaller doses! The natural world isn’t so black and white after all. There are indeed many shades of grey. We humans have much to learn from this teaching. Now that my awareness of Red Baneberry has been rekindled, I’m sure that I’ll be noticing it everywhere from this point on. That’s the thing about nature awareness. Once you begin on this path of stopping to notice things with all of your senses, you will never perceive the natural world in the same way as you did before. This time of year, as we savor the wild edible berry abundance of late summer and transition into the “East” of this school-year’s programs here at Feather and Frond Forest School, it’s only natural for Patrick and I to hold lots of space to acquaint— and re-acquaint— our students with the potential hazards that wild things may present to us in the forest. Although I don’t condone living a life full of fear, I do like to err on the side of caution when it comes to teaching children about wild edibles. Patrick and I are firm in our rule that each student must ask permission before harvesting and consuming any plant whatsoever while they are at our programs. Whenever we do encounter a plant that is toxic at programs, we take the time to point it out and closely examine it as a group, noting any edible lookalikes. This year, I’ll be sure to seek out some Red Baneberry so we can all take a real close look at this fascinating plant species and learn from our observations of it. May we all heed Jim's words and remember to pause and crack open this book of nature each and every day, no matter how old we are. Today I thank Red Baneberry for re-enlivening my natural sense of curiosity and reminding me that although I do know a lot of things about nature, there will always be something else out there to meet and get to know more deeply with my senses.